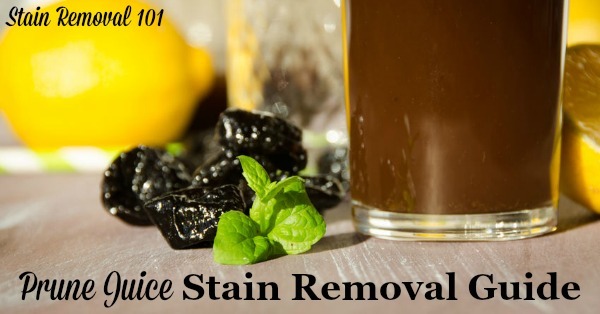 Prune juice stain removal can be tricky, because the juice from the prunes is very dark. 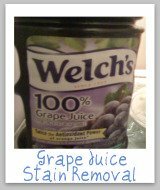 But that doesn't mean you should give up your morning glass of prune juice, but instead just treat these stains quickly when they occur. 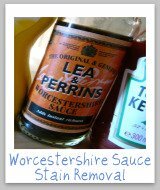 As with most stains the quicker you treat them the easier they will be to remove. This means you must get to them before they set, which can take place with either time or with heat. Below are step by step instructions for removing these spots from your clothing, upholstery and carpet. Step 1: Rinse the excess liquid from the prunes from the fabric, and flush the area with cool water, being careful not to spread the spot further. 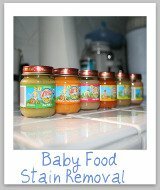 Step 2: Make a solution of half a teaspoon of liquid laundry detergent, mixed with a tablespoon of white vinegar, and a quart of warm water. Let the stained fabric soak in this solution for about 15 minutes. Step 3: Thoroughly rinse the fabric with clear cool water. Step 4: Launder in the hottest water the fabric will allow to get out the spot, and either chlorine bleach if the fabric will allow it, or oxygen bleach if not. Hint: Make sure the stain is gone after washing, but before you place in the dryer or you may set it. Repeat if necessary. 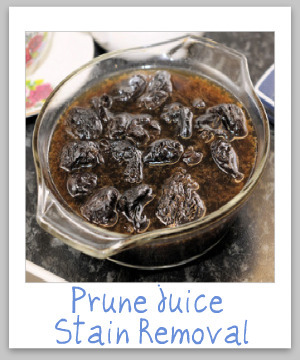 Step 1: Blot up as much of the prune juice as possible, being careful not to spread the stain. Step 2: Mix a solution of 2/3 of a cup of rubbing alcohol and one tablespoon of white vinegar. Step 3: Using this solution, sponge the spot with a clean white cloth. Step 4: Next, blot until the liquid is absorbed. Step 5: Repeat steps 3-4 until the prune juice stain is removed from the upholstery. Hint: Be sure to get the upholstery only as wet as necessary for prune juice stain removal. 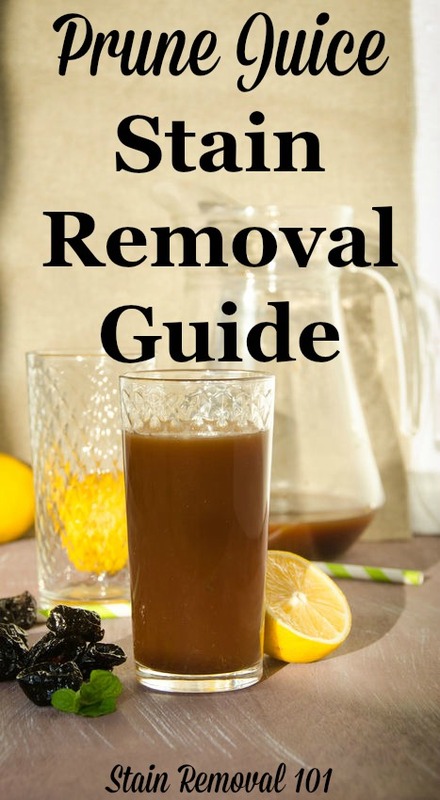 The instructions for prune juice stain removal from carpet is the same as for upholstery. First, you can mix a solution of one tablespoon of ammonia with two cups warm water, and try that as a stain remover. Hint: Please note though that ammonia and vinegar, because one is an alkali and the other an acid, will neutralize one another, so thoroughly rinse the alcohol/vinegar solution before trying the ammonia solution. In the alternative you can mix a solution of one tablespoon of liquid dish detergent and two cups of warm water, and use this as a stain removal solution. Hint: Please note that this solution may be milder on your carpet than the alcohol/vinegar solution, so you may want to try it first. 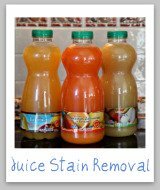 You may also find this video on how to remove fruit juice stains from carpet helpful.